16 Nov 2018 – Can you imagine a “democracy” in which the president handpicks a council that proceeds to dismiss the Constitutional Court, the Judicial Council which oversees the judiciary, the National Electoral Council, the Attorney General, the ombudsman, and all six major regulators (superintendents)? The president of the CPCCS-T [Julio Cesar Trujillo] has explicitly declared that if his Council’s decisions contradict the Constitution, then the former would prevail, because they are equivalent, according to him, to a Constituent Assembly. In reality, a constituent disenfranchisementis being carried out, without any authorization or even the knowledge of its supposed constituents: the Ecuadorian people. The only constitutional aspect of question 3 in the referendum was the proposal that future members of the CPCCS be selected by popular vote and not through open contests based on merit. The Government knows that it will lose those elections, and is aware of all the abuses it perpetrated, so Trujillo has therefore proposed – that at the same time local elections are held in March of 2019 – that another referendum take place so that the people can give blanket approval to all the violations and also eliminate the CPCCS! In other words, in the same elections where the definitive members of the CPCCS were supposed be elected for the first time by popular vote, it is proposed that the CPCCS be eliminated after the handpicked CPCCS-T has already changed all the control authorities – the perfect coup d’État. Our adversaries lost the [2017 Presidential] elections but took power anyway as we were betrayed. People voted for the continuation of the Citizen Revolution, but the program of the losing candidate was implemented. The referendum itself was the central proposal of the candidate who was defeated at the polls. This would not be possible without the brazen support of large media corporations. To pull off this coup d’État, it was necessary to get rid of Vice President Jorge Glas. This was achieved by implicating him in the corruption case regarding Odebrecht, which occurred in twelve countries. Odebrecht, a Brazilian company, was probably the largest construction company in Latin America, but it created an entire department dedicated to dispensing bribes to public officials. On October 2, 2017, the Vice President was illegally placed in pre-trial detention. After 90 days, the President of the Republic directly declared the position abandoned and appointed the replacement of the Vice President, without waiting for any ruling by the Constitutional Court, as ordered by the Constitution. Vice President Glas was implicated exclusively on the basis of the false testimony of a corrupt Odebrecht official. Glas was convicted of a crime that was not the one for which his immunity was lifted; and they sentenced him with a repealed code in order to increase the penalty and thereby prevent him from walking free and retaking the Vice Presidency. All this is unthinkable if the rule of law exists. Meanwhile, the self-confessed corrupt Odebrecht officials were not pursued by Ecuadorian prosecutors, clearly revealing that a pact had been made that they’d be left alone if they accused the Vice President. In March, the president of the National Assembly was dismissed, a former ally of the government who explicitly denounced the pact that had been made with Odebrecht. As in any other country in the world, the Vice President of the Assembly was supposed to have replaced him, but, again violating the Constitution, the Government made political deals in order to appoint another person. That is, in addition to not having a Constitutional Court, and in addition to having all its control authorities illegally appointed, Ecuador has both a Vice President and a President of the National Assembly who were unconstitutionally appointed. To this day, not a cent of illegally obtained money has been shown to have been received by Vice President Glas, which is recognized even by media that always opposed the Citizen’s Revolution. One of this media’s most prominent voices just admitted that the Vice President is imprisoned without evidence against him, but by “the force of circumstances”. Read “the media’s lynching”. On October 21, Vice President Jorge Glas was transferred from a minimum security prison to a common prison. This was done by the Government in reprisal for Fernando Alvarado, former Secretary of Communication (another persecuted politician) breaking his ankle bracelet and seeking asylum in a friendly country. This reminds us of Nazi tactics: if a prisoner escapes, you kill five as revenge and as a deterrent. As in periods of fascism, reprisals are taken against the family and partners of the alleged offenders. Even thoughpretrial measures can only be ordered by judges, the Government also announced that all members of my government who are supposedly being “investigated” are prohibited from leaving the country, revealing total control of the justice system and directly violating the American Convention on Human Rights. To top it off, the acting prosecutor also said that in the next few days he will name perpetrators and accomplices of crimes perpetrated against the State, and that he will request the corresponding pretrial measures to prevent the “flight” of those who could be involved in these “crimes”. In January of 2018, in an absolutely illegal way and through direct interference of the Government, they took away from us the party that I founded, the most successful and largest in Ecuadorian history: Alianza País. We have tried three times to register a new political movement that represents the Citizens’ Revolution, but we have been illegally prevented from doing it. Trampling our political and human rights, and democracy itself, the country’s main political force, the Citizens’ Revolution – which in the last elections obtained nearly 40 percent of the citizens’ vote – is without a legally recognized political organization and is prevented from participating in elections. Finally, as already mentioned, judicial persecution has been unleashed against the members of my Government. The main instruments of this persecution are the “transitory” comptroller whose appointment followed no legal process whatsoever – and the handpicked “acting prosecutor” – a position that does not exist in Ecuadorian law. My former administrative team has been targeted by about 300 audits of the Comptroller’s Office with criminal implications. The reports do not even mention the legal articles where the alleged crimes are described. Many of these former collaborators of mine are out of work and have had to sell their homes, vehicles, etc., in order to pay their lawyers. Anyone who believes that these are mere “opinions” of mine should ask the Ecuadorian State for concrete things like the legal documents that correspond to the appointments of the comptroller, prosecutor or Judicial Council and analyze if they are constitutional. They simply do not exist. In my personal case, I have 14 criminal proceedings against me, for things as ridiculous as a supposedly exceeding a legal limit on Ecuador’s public debt, which, in addition to being false, is not criminal, never mind that the president is not directly responsible for debt management. They accuse me for a decree stating that, to meet the 40 percent maximum public debt / GDP ratio, a limit that we set ourselves set in 2010, said the public debt had to be measured in a consolidated manner, as per an IMF manual. The Comptroller apparently did not like this, and therefore asks that a criminal investigation be initiated against an ex-president. Another example is an accusation regarding the concession of an oil field called Singue, which I had not even heard of. I am implicated in the case because one of the companies sent a letter to the Presidency denouncing that it had been damaged. I never read the letter. Hundreds of communications arrive daily to the Presidency. The letter was forwarded directly to the corresponding ministry, but, even if I had read it, there is nothing criminal here. Imagine the precedent! Anyone who seeks to implicate the President in an alleged crime simply sends a letter to the Presidency, and that is enough. Finally, since they could never prove me corrupt, nor will they ever, they implicate me in supposed cases of repression: kidnapping, murder and even an extrajudicial execution of a police officer killed by crossfire while protecting me on September 30, 2010 – when there was a coup d’état and it was me that they wanted to kill. They put forward outlandish theories, for example that I had turned the intelligence services into a political police. In one of the cases, they hired supposed experts who compared my Government with the dictatorships of the Southern Cone, where, in Argentina alone, there were 30,000 dead and missing. But it turns out that all the alleged cases of repression are before 2013, when the current President of Ecuador was Vice President. How is it possible that he did not know something so serious? It’s obvious that they lie. The case that has advanced the most is the so-called Balda case, for which I have been called to trial in the most absurd way. I even had an arrest warrant against me since I was ordered to appear every 15 days in Quito, which was impossible because, as everyone knows, I have lived in Belgium for more than a year. The false testimony of the confessed intellectual author of the alleged kidnapping, a policeman I do not even know, but who, according to his story, met with me three times and spoke with me on the phone three times is what involves me in the case. They already had to admit that he lied when he said that he had met with me and that they have no proof of the alleged calls. We’ve already managed to show that during one of the alleged calls I was actually flying from Guayaquil to Quito. In present day Ecuador, where the presumption of innocence no longer exists, the state does not have to prove someone’s guilt. Instead, after any false testimony, the accused has to prove their innocence. The press has depicted Balda, the alleged victim, as a legislator, which is false. In fact, this guy has a long criminal record, was a fugitive from justice in Colombia, was dedicated to computer hacking, and was held for 35 minutes by his associates during these illegal activities. Shortly after the alleged kidnapping, he was deported by the Colombian government, since, in addition, his status in Colombia was not legal. In 2013, Balda filed a complaint in Ecuador about this alleged kidnapping, where among the many defendants he does not even mention me. Then, in 2015 he filed a complaint in Colombia against members of my government and against me, a complaint dismissed by the Colombian Prosecutor’s Office for lack of evidence. 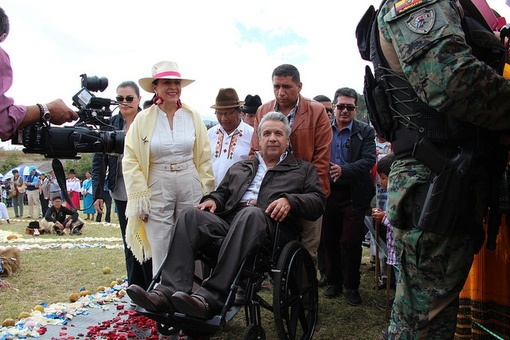 Despite this, six years later, in April 2018, the case was reopened in Ecuador, the press giving it sensationalist coverage and portraying it as a “state crime” against a “legislator”. In October of 2017 President Lenin Moreno announced that he had not lost hope of seeing me imprisoned, and Balda himself in November sent messages on social media saying that there would soon be a red alert from Interpol against me. Clearly, everything was planned. One of Moreno’s main advisers admitted that he traveled to Spain, where a former intelligence secretary also implicated in the case resides, to tell him to surrender and accuse me. In exchange for that they would help him; otherwise, they were going to “rain criminal charges” on him. We have documents and audiovisual evidence showing all of this. Lawfare is a regional strategy. It is what they are also doing against Lula da Silva and Cristina Fernández. Its main instruments are the press and co-opted judges. Judge Moro’s case is classic. He orders prison for Lula in a case of corruption that is extremely dubious, and in this way prevents him from participating in the presidential elections in Brazil, even though he was the frontrunner in the polls, thus opening the doors for the triumph of the fascist Jair Bolsonaro. Moro will be the Minister of Justice of the new Government. It is all crystal clear. The double standards are also infuriating. The only thing that exists in the international agenda on Latin America is Venezuela. If our leftist parties had perpetrated a coup d’état like Brazil’s, or trampled all over the constitution as in Ecuador, or if our governments had persecuted political opponents as they are doing with Lula, Cristina, Jorge Glas or me, we would already be hauled before the International Criminal Court. There is too much hypocrisy. In all Latin America, but particularly in Ecuador, not only democracy is being destroyed, but also the very pillars of civilization: justice, human rights, and truth. There were seven unrelated questions in the referendum. Rafael Vicente Correa Delgado is an Ecuadorian politician and economist who served as President of Ecuador from 2007 to 2017. The leader of the PAIS Alliance political movement, Correa is a democratic socialist and his administration focused on the implementation of left-wing policies. So sad-as well as Trump (with Boltonarsol!) and Bolsonaro, plus Argentina’s neolibs, we have what was an excellent government for the people being replaced by Moreno and his mob. After the years of people power, we are going back to the bad old days of US imperialism, misery for the masses and destruction of what remains of the environment. It seems to be easy to mislead the public with the help of lies and sophisticated techniques and getting rid of opponents helps those remaining to stay in power.